Don't forget that we're holding our annual Child's Play fundraiser here in Denver on Nov. 19. The evening will be filled with Rock Band and DJ Hero up on stage, a mountain of swag that we'll be giving away and a few high-end silent auction items. A box showed up on my doorstep yesterday with a copy of Uncharted 2: Among Thieves Fortune Hunter's Edition. No note, or mention of why I received it, so I'm going to auction it off. Thanks to whoever sent it my way. The edition includes those download keycodes as well as a CD of the game's soundtrack and a copy of the Brady Games guide. 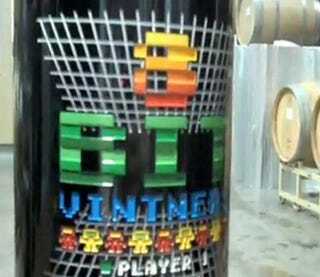 Michael James, founder of 8BitVintners, is donating a 3L etched bottle of his wine for the event. These limited run bottles aren't for sale anywhere. Check out this video to see the wine being bottled. We also have the limited edition Brutal Legend statue to auction off. I'll be posting more details about our Nov. 19 event as we get closer to the day. Hope you can make it!